Apple Red Big Party Pack Plastic Cups, 16 oz. Toast to a special occasion with our Apple Red Big Party Pack Plastic Cups! 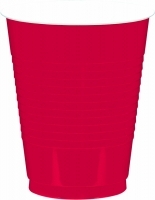 Cups are perfect for adding a splash of color to parties, showers, sporting events and more! Package includes 50 plastic cups able to hold 16oz. of liquid.